Stop spending big bucks to have foil added to your invitations, stationary, business cards and more by sending them to a print shop. Now you can add your own beautiful iridescent foil accents with iridescent reactive foil fusing rolls. This special document foil sticks to dry toner*, so almost any standard copier (and some laser printers) will work. Pair with one of our foil fusing machines, offering consistent heat and pressure to offer the cleanest finish look. Our iridescent foil colors have either a silver or transparent underlay, so you have the option of a popular silver base tone, or adding a little touch of color by printing your design in a colored toner that will show through, offering a more customizable base tone. This foil can stick to smooth paper stocks of many thicknesses; it does, however, have problems sticking to textured papers. Note: If you are using a Foil Fusing Machine, please select the 24" x 500' roll size to ensure a 1" core (required for use with the machines). Depending on your machine, you may need to cut the rolls down using the foil roll cutter, or have us custom cut them for you by calling (866)537-2244 (866)537-2244 . * The adhesive on foil rolls sticks to dry toner only; it will not work with wax based inks from laser printers. With our iridescent foil fusing rolls you get a beautiful rainbow design that changes in the light. 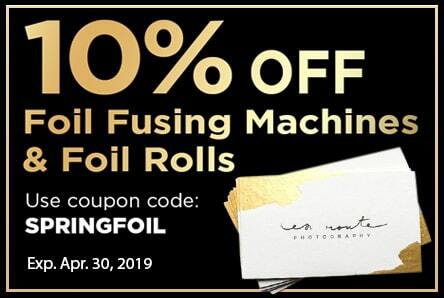 Perfect for adding a touch of class or uniqueness to business cards, letter hear, wedding invitations and so much more, these foil rolls are applied with the consistent heat and pressure that is offered by our foil fusing machines. It will stick to the dry toner* that is used in most standard copiers (and some laser printers). Reactive foils work well with smooth paper stocks** of many kinds - all you have to do is print your design or text using a dry toner copier, then apply this foil to your page and run it through a foil fusing machine. When the page comes out of the machine, just peel off the foil sheet and you will have a gorgeous foil pattern that has stuck to the toner only. Other heat machines, such as pouch laminators, might work with toner adhesive foiling rolls as well, however, may require more heat testing and adjusting to get a perfect finished print, and they are not guaranteed to work. These iridescent colors offer a shimmery, rainbow look, available in three different colors and two different "underlays". The underlay is kind of a base color, and comes in either an opaque silver-tone that will not show the ink through, or a transparent underlay that has a clear backing. The clear backing allows for more customization of the finished look, because you can apply it to a colored toner and the color will will show through underneath the foil, changing the overall look and tone***. Foiling with iridescent foil is a great way to DIY wedding invitations, awards, craft projects, business cards, letter head or anything else that may benefit from bright accents. Note: If you are using one of our Foil Fusing Machines, please select the 24" x 500' roll size, as they feature the 1" core that is required for use with the machines. * The adhesive on the back of these foil rolls sticks to dry toner only; it will not work with wax based inks that are most often used with laser printers, inkjet printers, etc. ** The adhesive applies well to smooth paper stocks of a variety of thicknesses. It does not, however, create a solid/consistent look on textured papers. *** Iridescent foils change color, tone & hue when moved and in different lighting. Hi, my name is Mallory, and today I am going to show you how to turn a printed sheet into a gorgeous foiled print using a pouch laminator. Ok, so the first thing you need to do it print the design you want to foil. It needs to be printed using a dry toner ink onto a smooth paper stock. Thicker paper like cardstock works fine, as long as there is no texture and the ink used is a dry toner (not an inkjet or other wax-based ink). You are also going to need a pouch carrier, which is this folder here. This is going to protect your laminator. Now place your printed sheet onto the pouch carrier, and lay your foil roll over your design. Make sure all the ink that you want to foil is covered. Next, cut your foil to fit the design. Place the foil with the non-colored, gray side down over the portion of your design that you want to foil. So I’ve trimmed my foil, and now I am going to place a piece of scrap paper on top of the foil to prevent it from transferring onto my carrier. If your foil overlaps your printed sheet, you can also place a piece of scrap paper below your design. Now bring it over to your pouch laminator, which should be pre-heated. The temperature to use is going to vary quite a bit, depending on the supplies you are using, including the paper thickness, the laminator, and even the foil itself, because some colors need a little extra heat. You may need to do some testing before you can get the perfect finish, so be sure to have plenty of printed sheets to work with. I am using the professional, James Burn SpeedyLam 330R, set to 150 degrees Celsius (or about 300 degrees Fahrenheit) using a speed setting of 2. Other laminators may work as well, but there are a couple things you need to keep in mind… they need to have adjustable heat and adjustable speed settings in order to work. They also have to hit really hot temperatures, the minimum typically being about 300 degrees Fahrenheit (but again, that will vary depending on several factors, which is why adjustable heat is necessary). It also needs to be able to handle a 10 mil thick pouch minimum, since we are using a thick pouch carrier and scrap paper. If you’re using one of the smaller home office pouch laminators, it might still work, you may just have to run it through more than once to get the foil to stick. So we’re going to lay our carrier flat and open it up. There may be some static, which for me lifted up my scrap paper. You can kind of see where it grabbed the design here. Now find an edge and peel it up. This is my favorite part...Voilah! You’re done. The color used is our regular metallic gold, which is our most popular. We have several other golds available, including matte gold and rose gold too. Plus a ton of other colors, holographic patterns, iridescent rainbow colors, and more. You can see here that I should have placed a piece of scrap paper below my design, because my foil overlapped my print and stuck onto my pouch carrier. Iridescent toner foil allows you to create stunning cards, invitations, letter head, and so much more! Available in rainbow or gold colors, these foil fusing rolls offer a gorgeous shimmer and rainbow affect. Featured in this video is our "Rainbow Iridescent" foil with a silver underlay. This pattern is also available with a transparent underlay. As shown in the video, these unique foil rolls change color and hues as they are moved and exposed to different lighting. Q: Toner from my pouch carrier got onto my project...how can I stop this? If you have parts of your design that are not being foiled, it is possible that the toner may transfer onto your pouch carrier and, potentially, from the carrier onto future projects. To stop this from happening, simply cover up any toner not being foiled with a sheet of blank scratch paper. Q: How can I make the foil more solid? If your foil is not perfect, it could be caused by one or more of several factors: the paper, the toner ink, the heat, or the foil itself. These troubleshooting tips should be helpful in determining the problem, and helping you fix it. Q: What are the best laminators for foiling? Not all laminators will work well for foiling. Here is a list of the top 4 best laminators for foiling. Q: Does it come in rolls wider than 24"? No, 24" is the widest roll we currently offer. Q: Do you have more resources to help me foil?